Iron Complex is a unique composition of iron (Ferrochel®) in its composition we can also find vitamin C, folic acid, vitamin B-12, Dong Quai (Angelica sinensis) and Red Raspberry. Such a composition of the preparation makes it easily digestible and body friendly. Ferrochel® is a patented form of iron in the form of amino acid (Fe2+). Fe2+ is combined with two molecules of the amino acid - glycine. Its advantage is a significant increase of bioretention while reducing irritation of gastrointestinal tract. Iron is essential in the human body. The biggest amount of it - approx. 70% remains bound to hemoglobin of circulating red blood cells. The desired value of iron in the body is about 3g, and its daily requirement is necessary, but little. Iron is involved in the transport and storage of oxygen in tissues. It is also necessary in many metabolic processes - in the synthesis and catabolism of certain hormones, the creation of energetic-rich compounds, or the synthesis of collagen. His absence, or a deficiency in the body is conducive to anemia, which means a reduction in hemoglobin, red blood cells (erythrocytes) and the ratio of hematocrit below normal. The anemia of iron deficiency refers to an average of about 5% of the population. However, it is higher (20%) in the case of menstruating women and children (30-40%). Often, lack of iron results in anemia - a serious disease in which there are disorders of red blood cells and the amount of hemoglobin, a red blood pigment. Vitamin C is one of the essential vitamins playing important roles in the body. It is a compound with strong antioxidant properties, protecting DNA cells against hostile effects of free radicals it prevents mutations and cancer. It has a very large impact on the immune system. It mobilizes the body to fight infections, colds, flu and strep throat. Vitamin C included in a daily diet promotes hematopoiesis. It also participates in the metabolism of fats, cholesterol and bile acids, protecting the cardiovascular system. 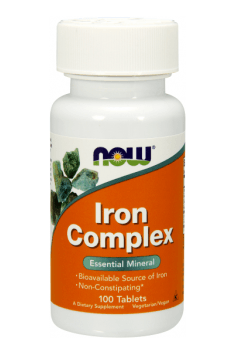 A preparation Iron Complex facilitates the absorption of iron from the gastrointestinal tract. Vitamin B12 (Cyanocobalamin) is an enzyme contaning cobalt. It belongs to the group of water soluble vitamins supplied under physiological conditions predominantly in food of animal origin. It is essential for the growth of the organism, cell division, hematopoiesis and myelin synthesis. As a coenzyme it is involved in the synthesis of purine and pyrimidine, it accelerates protein metabolism, is a transmethylation coenzyme and the synthesis of methyl groups. It has a significant effect on hematopoiesis acting synergistically with iron. Vitamin B12 deficiency causes the development of megaloblastic anemia, which is characterized by the presence of large cells in the peripheral blood. Folic acid is classified as a vitamin of group B (vitamin B4.). It has a big impact on the level of serotonin, which obviously affects the mood. Folic acid is necessary for the proper functioninf of erythrocytes. Anemia from vitamin folic acid deficiency, as well as of the lack of vitamin B12 deficiency, causes a disturbance in DNA synthesis and the impairment of the maturation of cell nuclei. Chinese angelica (Angelica sinensis) is a species of plant from a celer plant family. It occurs naturally in China. It stimulates blood circulation, strengthens the immune system, increases the production of white blood cells and helps the body in removing harmful toxins. It is recommended especially to women – it relieves symptoms of menopause, hormonal stabilizes hormone economy and many other women ailments. Among women it is called "A woman ginseng." Red Raspberry – it is hard not to appreciate it. It has an excellent flavor and valuable health properties of fruit and raspberry leaf. Raspberries are a source of organic acid (among others, malic acid, ascorbic acid, citric acid), vitamins (B1, B2, B6, C and PP) and mineral salts (calcium, potassium, magnesium, iron). They have antioxidant properties, they lower blood pressure and prevent the vascular endothelial dysfunction, which proves their health-promoting properties affecting the cardiovascular system. Raspberry leaves are rich in tannins, flavonoids and phenolic acids, and thus they have diuretic, antibacterial properties, and also improve metabolism. One tablet per day after a meal. It is recommended to be used after consultation with a specialist. Prolonged and excessive use of iron preparations may contribute to the disorder of its metabolism in the body. In order to increase the bioavailability of iron it should be combine with vitamin C.
Cellulose, Stearic Acid (vegetable source), Croscarmellose Sodium, Silica, Magnesium Stearate (vegetable source) and Vegetarian Coating. Raspberry (Rubus idaeus) - bush growing wild or in gardens on the sandy areas in the northern hemisphere. Food ingredients are: raspberry fruit (Fructus Rubi idaei) and leaves (Folium Rubi idaei). Fruits contain organic acids (mainly ascorbic acid or vitamin C), sugars and pectin, vitamins A, B1, B2 and trace elements (phosphorus, magnesium, potassium, sodium, and iron). Infusions of fresh or dried fruit is used in colds and fever and digestive disorders of children and adolescents. The leaves are anti-inflammatory and antibacterial and relaxant on smooth muscles of the intestines, blood vessels and uterus. More effective action have raspberries growing wild on the edge of the forests. Juices and syrups, jams and liqueurs can be produced of the raspberries.